Gambit is an all-new mode introduced in Destiny 2: Forsaken expansion, and it's arguably the best part of the DLC. It's also a tad confusing if you're jumping into it sight unseen, so here's some tips to help you along and assist you in picking up that shiny new Ace of Spades. Think of Gambit as a game of two goals: slamming balls (motes) into your goal, and killing a boss after you slam 75. That's it. You operate as a team of four on your own individual map, which is linked to an identical enemy map by way of a portal. Along the way you can mess with your opponent's board with "blocks" and visit their arena, thus creating PVP situations. Let's start with the most important tip: how to clear the first step of the Cayde's Will questline, which unlocks the Ace of Spades. Notice the "get five invasion kills with a hand cannon" requirement. That task should actually read "kill five players who are invading you." If you're anxious to knock this goal out of the way it's best to focus on defense and stay on your "side" to ensure you have the greatest chance of killing invaders. To actually knock the quest out you'll want to use the Drang (purple energy sidearm) and Sturm (exotic kinetic hand cannon) combo. These weapons actually combo off one another in that killing enemies with Drang will power up Sturm. What you'll want to do is off a ton of enemies with Drang, saving Sturm up for blowing invaders away. Always always always go for the "first block" in a game. Grab five motes as quickly as you can then hightail it back to your basket and slam them in. Blocks will force your enemy's basket to retreat underground and summon enemies onto the field: they can't score points unless they take them out. Blocks come in increments of five, 10, and 15 of the "small, medium and large" variety. The bigger the block the badder the enemy, so if you're sure you can survive all the way up to 15 you could try (Warlocks with multiple forms of healing, especially with the new solar super, are great at this). Don't go overboard and hoard your motes though: I like to rush the start of a second or third round (Gambit is a best of three mode) with a super, grab five motes, and dunk right away. Sometimes you'll want to slam a small block because it's the best thing to do in that particular situation. Notice the bars on the top of the screen? The number denotes each team's actual score, and the white bar shows how many motes players are currently holding. If you see that the enemy team's score is low but their white bar is nearly full, throwing out a block immediately so they can't dunk all of their motes en masse will stall them. Now's your chance to invade and really capitalize on this power play. Invading at the right times is incredibly important. If you drop in on an enemy that has zero collective motes and you kill all of them, you may have bought your team a good 30 second lead. If you zone in when they're carrying 10 motes each and take them out, wiping their chance to dunk them, you're looking at a sizable lead. 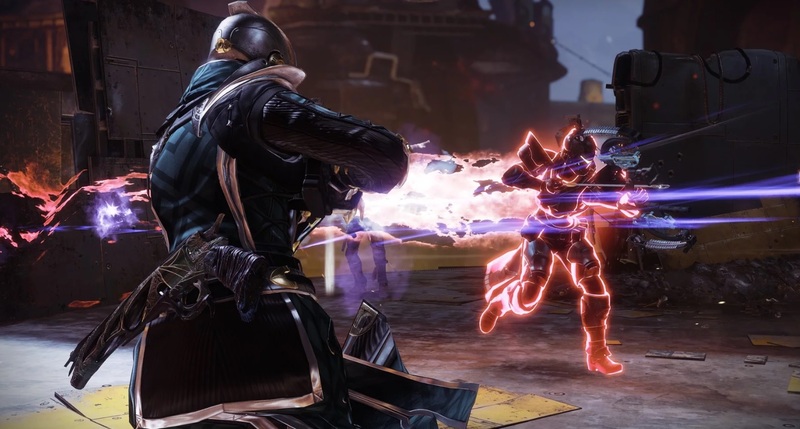 Save your supers for three cases: if someone is invading you and your team is holding a lot of motes, if you're about to invade a team yourself and they're holding onto motes, or right at the exact moment a boss appears. In the latter situation you'll be able to immediately clear out all of the trash and focus in on the boss with all of your heavy ammo.